The School of Business has maintained its business accreditation by AACSB International. Additionally, the Accounting Program also maintained specialized AACSB Accreditation. Founded in 1916, AACSB International is the longest serving global accrediting body for business schools that offer undergraduate, master’s and doctoral degrees in business and accounting. The Association to Advance Collegiate Schools of Business (AACSB) Accreditation is the hallmark of excellence in business education and has been earned by less than five percent of the world’s business schools. Today, there are 633 business schools in 40 countries that maintain AACSB Accreditation. Similarly, 177 institutions maintain an additional specialized AACSB Accreditation for their accounting programs. To maintain accreditation a business program must undergo a rigorous internal review every five years, at which the program must demonstrate its continued commitment to the 21 quality standards relating to faculty qualification, strategic management of resources and interactions of faculty and students, as well as a commitment to continuous improvement and achievement of learning goals in degree programs. To learn more about AACSB International Accreditation, visit the AACSB International website at www.aacsb.edu. Maria Nagan, associate professor of chemistry, has been appointed director of the Office of Student Research. The University created the OSR in 2009 to promote, facilitate, highlight and assess faculty-mentored student research and creative activities across all disciplines. The OSR supports research through academic-year and summer grant opportunities, coordinating travel to the National Conference on Undergraduate Research and organizing the Truman Student Research Conference, among other things. A member of the Truman faculty since 2000, Nagan is a 2010 recipient of the Walker and Doris Allen Fellowship for Faculty Excellence. She has a Ph.D. in chemistry from the University of Minnesota, Twin Cities, with specialty areas of biology and physical chemistry. She earned her bachelor’s degree from Grinnell College in Iowa. Her research interests include molecular dynamics simulations of RNA and protein-RNA complexes, particularly those containing modified nucleic acid bases. Nagan was appointed to an annually renewable term. She succeeds Matthew Beaky, associate professor of physics, who served as the inaugural OSR director. This summer, Michael Kelrick was appointed chair of the Biology Department. For the previous three and half years, Kelrick served as the director of Interdisciplinary Studies. He worked to support and develop Truman’s Interdisciplinary Studies programs and to nurture the relatively new Student Initiated Course and Student Initiated Learning Opportunity programs. Marty Eisenberg, associate provost, will serve as the interim director of Interdisciplinary Studies for the 2011-2012 academic year. Elaine Scudder, materials manager and purchaser in the School of Science and Mathematics, was named the Outstanding Scientific Materials Manager of the Year during the NAOSMM convention July 24-29 in Minneapolis, Minn. The Manager of the Year award is the highest honor given by the National Association of Scientific Materials Managers (NAOSMM). The nomination process includes compiling many letters of recommendation from colleagues, members of NAOSMM and vendors. Community service is also considered, along with contributions to the profession and exemplary work at the nominee’s institution. 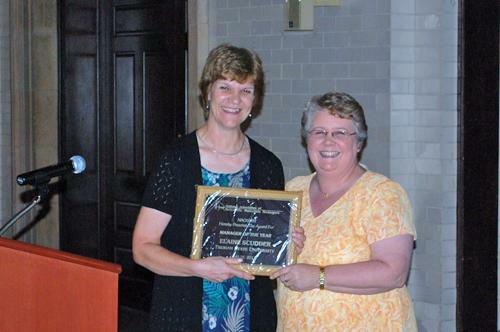 Elaine Scudder, left, accepts the plaque for Outstanding Scientific Materials Manager of the Year from Carol Bowman, president of NAOSMM. Scudder has been a University employee for 23 years. Throughout her 20-year membership with NAOSMM, she has occupied a number of leadership positions, including six years as national secretary, and was honored with the organization’s Outstanding Service Award in 2005. In addition to a plaque from NAOSMM, Scudder was also awarded a dolphin sculpture of Frabel Glass, donated and presented by Kimble-Chase Glass Company. NAOSMM is a group of approximately 500 individuals involved in purchasing, receiving, warehousing, distribution and inventory control of chemicals, pharmaceuticals, glassware, plasticware and instruments, as well as special services in research, teaching and research and development fields. Members include representatives from universities, colleges, manufacturers, research laboratories and pharmaceutical companies. Truman’s chapter of Sigma Delta Pi, the National Collegiate Hispanic Honor Society, was named co-recipient of the prestigious Ignacio and Sophie Galbis Award, presented annually to the most outstanding chapter nationwide for activities realized during the academic year. This is the third time since 2006 the Truman chapter has received this honor. Lucy F. Lee, the faculty adviser who also directed the chapter for its two previous awards, was instrumental in earning this year’s national recognition. Lee herself has a distinguished record in Sigma Delta Pi as the 2010 recipient of the Minaya Álvar Fáñez Award, granted yearly to Sigma Delta Pi’s outstanding chapter adviser nationwide. She was also the 2004 recipient of the José Martel Award, presented once every three years to the country’s most outstanding chapter adviser for activities conducted during a five-year period. Introductory class for the Master of Arts in Leadership program begins Aug. 31. In the Spring 2011 semester, Truman began a new master’s program designed for individuals wanting to advance personal and professional goals. The Master of Arts in Leadership program helps students acquire a greater understanding of how to lead and navigate organizations and how to build successful relations within and among organizations. The program includes a solid theoretical foundation in personal and organizational leadership, plus experiential learning consisting of simulations, case studies and internships that will enable students to progress from the study of leadership to its application and practice. Graduates of the program will have completed a specialization area designed to advance the individual’s personal leadership goals. For more information, go online to gradstudies.truman.edu/areasofstudy/Leadership.asp, call 785.4109 or email gradinfo@truman.edu. All sizes are only $5. 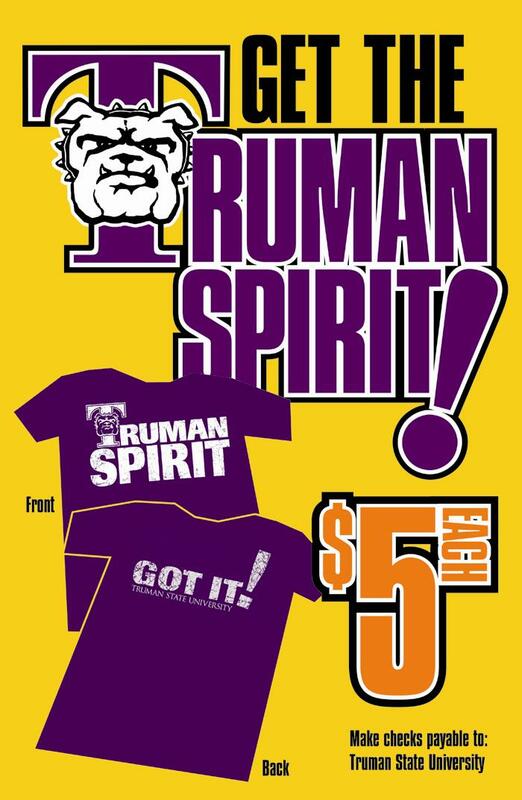 Spirit Shirts and can be purchased in the Public Relations Office in McClain Hall 202. Sizes range from small to 2XL. to perspective members and encourage campus involvement. Show a Truman ID for free food. The Kirksville Area Chamber of Commerce Retail Merchants Committee and Kirksville businesses are inviting all Truman, A.T. Still University and Moberly Area Community College students downtown for a Kirksville welcome. Businesses, churches and organizations will have tables set up on the courthouse lawn offering coupons, product samples and more. There will be live entertainment and free food. Contact the Kirksville Chamber of Commerce at 660.665.3766 for more information. *For ticket information, go to truman.edu/familyday. Eighteen students will present their progress in their faculty-mentored research projects. A complete program schedule can be found at osr.truman.edu. With this fund, students will be managing real money for the purpose of providing hands-on training and practice in the area of investment management. It will allow students to participate in all aspects of managing an endowment, including portfolio construction, asset allocation, investment policy statement maintenance and development, equity security analysis and performance reporting. 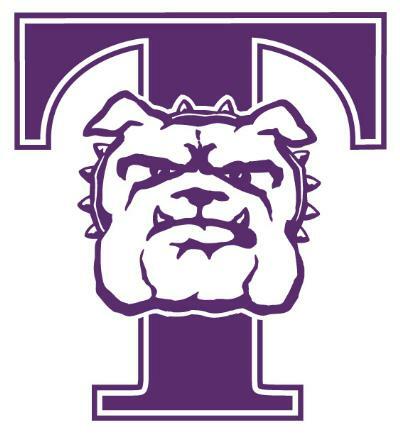 The Bulldog Student Investment Fund is sponsored by the School of Business with financial support from the Truman State University Foundation. For additional questions, contact Ryan Hashemi at rkh1164@truman.edu. The Bulldog football team is once again selling discount cards that may be utilized year round at more than 30 local businesses. These discount cards, fondly referred to as Dog Tags, can easily save a consumer upwards of $100 if used consistently throughout the school year. Dog Tags may be purchased for $10 in the Athletic Office in Pershing Building, from any member of the football team or in the Public Relations Office, McClain Hall 202. On Dec. 4, 2010, the Code of Policies of the Board of Governors was amended to prohibit smoking within 25 feet of any building on campus property. This policy change went into effect Aug. 1. Policy already prohibits the use of tobacco in buildings and vehicles owned and controlled by the University. Members of the campus community share the responsibility of adhering to and enforcing this policy. The campus community also has the responsibility of bringing this policy to the attention of visitors. Complaints and concerns should be brought to the attention of the appropriate department or supervisor. This is a REQUIRED class to drive Truman State University fleet full-size vans. Student drivers must also complete the Waiver of Vehicle Usage Policy form available online at police.truman.edu. Participants must sign up to attend and should allow 2-3 hours for the class. Class size is limited. To sign up, call 785.4177 or email joycecook@truman.edu. The Learning Technologies Team of IT Services would like to welcome you back to campus with a Classroom Update. Over the summer numerous teams from IT Services were hard at work building, upgrading and performing maintenance in classrooms across campus. Complete Classroom Builds – These rooms were either newly constructed spaces or had complete overhauls to the academic technology in the room. Thank you to all those who made this massive summer project possible. First of all to the ITS teams, student workers and Physical Plant staff; but also to the contractors, the secretaries, the department chairs, the deans, the provost and President Paino. Your commitment to improving classrooms will have an impact far into the future of Truman. Construction projects at the library are almost finished. Study rooms on south end of 2nd and 3rd floor will be available soon. Truman continues to collect materials generated on-campus for recycling, including aluminum, cardboard, paper and plastic. Materials should be placed in the recycling receptacles located throughout campus. For off-campus individuals, several recycling options are available, including the Sheltered Workshop at 1001 Osteopathy Street for cardboard and paper; High Hope Recycling at 906 E. Shepherd Avenue for cardboard and paper; and Perfect Metals at 3602 N. Industrial Road for aluminum and other metals. For the most recent updates, check the Master Calendar on the University home page or at calendar.truman.edu. Deadline: Each Friday by 3 p.m. The new issue of “Green Hills Literary Lantern” is now available online, with poetry, fiction and nonfiction, including essays by Joe Benevento, professor of English, and Adam Brooke Davis, professor of English, as well as reviews by Truman students Shawn Bodden, Kasey Perkins and Andrew Kindiger. It can be accessed at ghll.truman.edu/current.html. Myra Collins of the Regional Professional Development Center, along with Stacey Craigmyle, a teacher from North Shelby Schools, recently traveled to Indianapolis, Ind., to present at the 2011 Summer Conference for Learning Forward (formerly National Staff Development Council). The workshop, “Determining Levels of Rigor in Common Core State Standards,” was designed to help workshop participants apply the four levels of Depth of Knowledge to the Common Core State Standards for use in instruction and assessment development. Carolyn Cox, professor of health science, and Janice Clark Young, associate professor of health science, received their Master Certified Health Education Specialist (MCHES) credential from the National Commission for Health Education Credentialing, Inc., (NCHEC). Cox and Young were among the first 812 health education specialists to complete the MCHES Experience Documentation Opportunity process that opened Oct. 15, 2010 and closed April 16, 2011. During this process, applicants documented advanced-level practice in the field of health education and had recommenders attest to their performance and competence levels. Purple Friday Kick-Off will take place from 2-4 p.m. Aug. 26 on the Student Union Building Mall. There will be games, giveaways, sno-cones and performers. SAB will sponsor Welcome Back Comedian Adam Grabowski at 7 p.m. Aug. 26 in Baldwin Auditorium. Admission is free. DawgFest will take place from 2-5 p.m. Aug 27 on the Quad. DawgFest is the essential campus wide celebration of the new school year featuring games, contests, giveaways, local business vendors and music. Pizza Palooza will take place from 4:30-6:30 p.m. Aug. 30 on the McClain Mall. Local restaurants have been invited so participants can taste test their pizza and vote on who has the ‘best pizza in town.’ Tickets will be available in the Student Recreation Center or at the door. Funds will go to support intramurals. The Center for Student Involvement’s fall Activities Fair will take place from 1-5 p.m. Aug. 31 in the Student Union Building. Space is limited, and is on a first come, first serve basis. Contact the CSI at 785.4222 or csi@truman.edu for more information. Franklin Street Singers, Truman’s premiere show choir, will conduct auditions from 5:30-6:50 p.m. Aug. 30-Sept. 1 in Ophelia Parrish 2350. Participants should prepare a 60-second solo for the first day. All majors and years welcome. Email franklinstreetsingers@gmail.com with any questions. The Study Abroad Fair will take place from 12-4 p.m. Sept. 1 in the Student Union Building Activities Room. Students will have the opportunity to speak with other students who have studied abroad and ask any questions they may have. The Equestrian Team will host a new member information meeting at 8 p.m. Sept. 1 in Magruder Hall 2090. For more information, contact equestrian@truman.edu. McNair Research Presentations will take place Sept. 7 in the Student Union Building Alumni Room. For a complete presentation schedule, go to trumantoday.truman.edu/pdf/McNairResearch2011.pdf. SAB will sponsor slam poetry by Anis Mojgani at 7 p.m. Sept. 11 in the Student Union Building HUB. Admission is free and beverages will be provided. The Cardinal Key/Blue Key Blood Drive will take place from 10:30 a.m.-5:30 p.m. Sept. 13-14 in the Student Union Building Georgian Room. “Marketing Your Study Abroad Experience on Your Resume” will take place at 5 p.m. Sept. 14 in the Career Center. SAB applications are available now and are due Sept. 14 to the CSI. Applications are available online at sab.truman.edu or in the SAB Office in the lower level of the Student Union Building. Clifton Truman Daniel, the oldest grandson of former U.S. President Harry S. Truman will speak about his famous, but very ordinary, grandparents at 7:30 p.m. Sept. 16 in Baldwin Auditorium. His new book, “Dear Harry, Love Bess,” published by Truman State University Press, will be available to purchase and for Daniel to sign.